You’ve heard all of the warnings, but you still want to use free proxies. After spending a little bit of time using them, though, you noticed they have a major limitation. Most of them don’t work. You try to connect to the internet, only to get a timeout message. They are either too slow or they don’t exist. You can save yourself a lot of time on the process by using a proxy checker. These checkers let you scan your proxies in bulk. Then, you can find out if they are working. Basically, you will find a list of free proxies on the internet, run them through a scanner, and find out if they’re up and running. You’ll discard the ones that aren’t working and keep the ones that are. Then, you can start using them. It’s important to note that while some of the proxy scanners also check to see if a proxy is safe, that is typically an extra feature. In most cases, you will only know if a proxy is live. You won’t know if hackers operate it. That is why it is always best to go with a paid proxy that is run by a legitimate company. That is an easy way to keep your information safe. Now that you know the warnings, let’s look at some tips you need to follow when scanning proxies in bulk. Then, you’ll go over the actual tools you will use to scan your proxies. When you use a proxy checker, there are some tips you need to follow in order to have the most success. It is important to go over the tips before diving in with your checker. That way, you will know what to look for when you use the scanner. You’ll also know exactly what to expect after you scan your proxies. Most people use proxy scanners just to find working proxies. That is certainly important, but you also need to look at the speed. Some proxies work but they are still incredibly slow. Unless you don’t mind waiting several minutes to access information on a website, you need to look at the speed. Otherwise, you will spend most of your time online waiting for connections. That will get old fast. Some scanners let you sort by speed so you can find the fastest free proxies available. That is a good way to find usable free proxies. Keep in mind, though, that it is practically impossible to find free proxies that are as fast as dedicated proxies are. You are going to have to compromise some speed when you go with a free proxy. The country of origin is also important. It is always a good idea to choose what is considered a “low-risk” geolocation. Locations in the United States and Europe are typically solid since website administrators don’t view them as risky. However, if you go with a proxy that comes from a location known for cyberattacks, you will have a hard time getting access. You might end up getting banned. Then, you will have to move on to the next proxy on your list. This is another reason that so many people prefer just to buy their proxies. They can choose the location they want so they don’t have to remove proxies from the list. For instance, you can buy proxies that are based in the United States, and you will only receive proxies from that location. That is much easier that going through your list and removing ones that are from high-risk locations. If you are going to use free proxies, you have to understand that they shut down without a moment’s notice. What works today might not work tomorrow. That is why you need to keep your proxy checker handy. You will need to use it on a daily basis to see what is working. This is one of the reasons people get so frustrated with free proxies. They find something that works, and then when they need it, it is no longer active. That might be OK for basic web browsing, but if you’re trying to scrape data, buy sneakers, or do something else that is important, it can be incredibly frustrating. You might leave the house, thinking your proxy is working, only to come home and realize it has been shut down all day. Then, you have to start from the beginning. You can avoid this problem by using a dedicated proxy service. These services provide you with proxies that will work for as long as you need them. Now that you know some tips, it is time to look at the tools you can use to scan proxies. These tools make it much easier to find out which proxies are working and which ones aren’t. While they all work a little bit differently, the concept is the same across the board. You paste a list of proxies into the tool, and then it scans them all. It tests them for various factors. For instance, it makes sure the proxies are working and it lets you know the country of origin. Then, you look at the results and decide which proxies to use and which ones to discard. 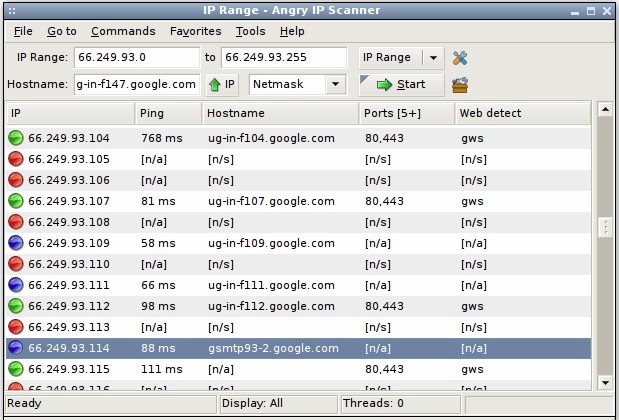 Angry IP Scanner is a free, open-source scanner. Because it is open source, it works on different platforms, including Mac, Linux, and Windows. Tons of people have downloaded and used this tool. If social proof is important to you, you might want to join the others and give it a try. It quickly pings to IP addresses to make sure they are working. It also scans the ports and gets the MAC addresses for the proxies. This is just a small sample of what this tool does. Once it has the information, you can use it to find out if the proxy is working. This will help you narrow down your proxy list. You can get rid of the ones that aren’t working and move forward with the ones that are. You don’t have to install Angry IP Scanner to use it. However, if you prefer to download it, it is available for download, as well. It’s important to note that you might get a Trojan or virus warning if you use this software. That is because some antivirus programs view it as a hacking tool. However, the program doesn’t have any malicious elements to it. Because it is open source, you are free to view the source code before using it. That will give you some confidence as you move forward. You can also use NMap: The Network Mapper to scan your proxies. This free checker has been around since 1997. Since it has been around so long, it’s had time to build up a nice community of users. If you want to be part of a community, this is a great tool for you. It’s also worth noting that the developers are constantly improving the software. That ensures that you get the best experience every time you use NMap. If you don’t have much technical experience, you can use it for port scanning, host discovery, and version and operating system detection. If you have some technical experience, you can get even more out of this tool. There really isn’t a limit to what you can do with it if you are tech savvy. ProxyFire has free and paid versions. Even the free version has a ton of options you can use when scanning proxies. You can use it to scan for dangerous IPs. In addition, you can use it to scan for the essentials, such as the port and country of origin. You will likely only need the free version of this software. However, if you need some advanced features, you can check out the paid version. It comes with some extras that some users like. InCloak is a simple online proxy scanner. This free checker has smart algorithms that filter the proxies for you. It is worth noting that this program is a little bit slower than some of the ones on the list. If you need it to check a single server, it will take around 30 seconds. However, if you need it to check 500 servers, it takes about 3 minutes. Both free and paid users get detailed reports at the end of the check. Go through the report to see which proxies are good and which ones you need to eliminate. Then, you will be ready to use your proxies. If you don’t mind using paid software, check out ScrapeBox. This is one of the top tools for proxy users. It has a ton of features, including a proxy checker. You can load large batches of proxies into the tool, and it will spit back the results quickly. You can filter your results by country, port, speed, and more. In addition, you can add custom sources and custom test your URLs. Along with the proxy checking tools, it has a lot of other features. You can use ScrapeBox to scrape websites and more. If you’re a serious proxy user, consider adding ScrapeBox to your online arsenal. Before you get started, it is important to look at some additional tips. These tips will help you as you move forward with your list of proxies. If you intend to purchase anything on the web, you need to use paid proxies. Your information can be compromised if you use a free proxy. Sure, you are supposed to be anonymous, but you don’t know who is running these proxies. If you choose free proxies that are run by hackers, you could end up with your identity compromised. Keeping with the same concept, you need to make sure your computer is secure before using a free proxy. Hackers could install malicious software if you use a free proxy. Then, they could take over your system or steal all of your information. It’s important that you have good antivirus software in place. Even if you do, though, your system could still be breached. Hackers are getting smarter every day. They learn how to get around programs, and it is up to antivirus software to keep up. That means that hackers are usually a step ahead, so even if you have the best software in place, your system could get breached. Of course, you could avoid this problem all together by using a paid proxy service. These services will keep your information safe. Then, you don’t have to worry about hackers taking over your system. If you’re using free proxies, you have to avoid peak hours if you want to optimize your performance. This is even true if you have found some fast free proxies. People who use free proxies share bandwidth, and that slows the process down a great deal. If you try to use them during peak hours, you are going to be disappointed. Of course, paid proxies provide peak performance all day and all night. You won’t notice dips in speed, even during peak hours. If speed is important to you, you are better off avoiding free proxies all together. Free proxies aren’t as good as paid proxies are, but if you are intent on using them, making sure you scan them ahead of time. Use these tips and tools to your advantage so you can find the top free proxies out there. Then, if you want to upgrade your proxies, add some paid ones into the mix. You will quickly notice how much better paid proxies work, and they don’t cost much per month. For just a few bucks, you can get the proxies you need to get the job done, whether you are browsing the internet or scraping data.